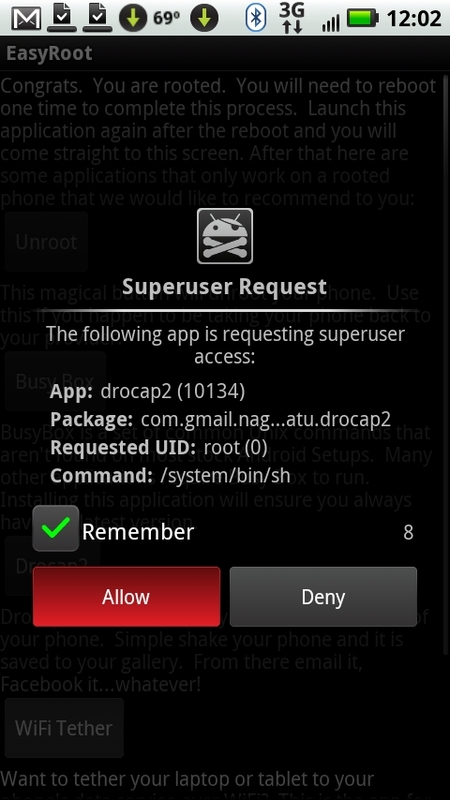 what do you mean by ROOTING an android phone? You would have heard root many times from your friends having android or on internet somewhere, and you always wonder what these term would be. so what exactly means rooting your android? According to wikipedia : Rooting is a process allowing users of smartphones, tablets, and other devices running the Android operating system to attain privileged control (known as "root access") within Android's subsystem. 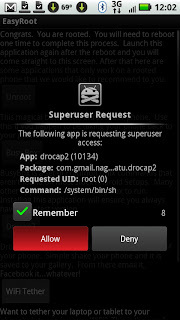 In simple language you can gain control of your phone by rooting( i.e be an admin of your device, called as superuser in android ). you will be able to control your processor, change its speed according to your need and main thing you can increase (overclock) its speed. but need to handle it with care as with great power comes great responsibility. Rooting is the process which makes you take control of your phone completely. And this can also be termed as " feature of an android phone, which Iphone users should be jealous of". For rooting your phone you don't need to know rocket science, it takes just few steps to root your phone, but care should be taken to download proper root file of your device, if you flash an root file of some other device on your device it can brick it (Bricking an android phone means you have damaged your phone software so badly that it cannot be used or repaired any further, as good as throwing your phone away, In most cases if your phone is stuck on your manufacturer logo or android logo and doesn't load any more then its said to be bricked). I am not discouraging you but just advising you to take proper care while flashing an root file. most of the user root their phones for installing custom rom's, because to flash an custom rom you need to be superuser (admin) of your device and that can be done only via rooting. so you would be asking, why do we take risk of bricking our phone? just for overclocking or changing processor speed? Believe me it is just not overclocking or changing processor speed its lot more. Having an android means you are forced to carry your charger along with you. through rooting you can install softwares that will let you change processor speed so that when you are low on battery and don't need phone more than just calling and messaging you can slow your processor to save you some battery. and there are softwares that will do it automatically for you. here is one of the software that can be helpful to you, CPU TUNER ( REMEMBER TO ROOT YOUR PHONE BEFORE). Rooting will help you install custom rom's, many people like me would be bored to use stock rom or default rom( rom is the phone software installed on your device, for example as samsung's stock rom is touchwiz) installed on your phone which is always slow,laggy and ugly. after rooting your phone you would be able to get many apps in playstore that would help you increase performance of your phone. Phone manufacturer gives us an guest privileges as they don't want us to damage internal software beyond repair. that's the reason we have to root our phone to get the most out of our phones because they don't have time for us to constantly give updates for our phones and make it an awesome affair for us to use their device. so it is upto us to get it done. and there are many software out in the market that would let you enjoy that. If you are having an old android phone and are bored of using the same old rom or same old version of android on your phone, and update for latest android version is no where near. so your best bet in this scenario will be to get an custom rom. now a days there are many custom roms on net which helps you in increasing performance, speed, graphics and will help you to fall in love with your old android phone again. For finding custom rom you can visit forums on xda-developers.com. Themes are basically the graphics that appear on your Android device. Rooting your device allows you the ability to fully customize just about every graphic on your device. You can load custom themes that totally change the look and feel of your device. There are many custom ROM’s and apps available for rooted devices that will allow you to drastically improve the performance (speed) and also extend battery life on your device. Rooting your device grants you the ability to update the Basebands on your smartphone. The Baseband is what controls the radio on your device. By updating to the latest Basebands, you can potentially improve both the signal and quality of your phone calls. As mentioned earlier, custom ROM’s can allow you to update to the latest version of the Android OS before they are officially released. This is a great feature for those who are tech-savvy and want to stay on top of the latest and greatest software updates before it hits the mainstream crowd. This is also useful if you have an outdated device that is no longer being updated by the manufacturer. so take care while rooting your phone as it may brick your phone, procedure to root your phone is not mentioned in this post because rooting method for all phone models are different so its better if you search for the one working on your model, but you will certainly find one method on xda forums or simple method to find is to google your "phone model space root" for eg "samsung galaxy ace s5830i root". I hope this post would have helped you. I added this video if you want to know more about why to root your phone. do it in right manner. Labels: reasons to root android, root advantages, root android, why root your droid, why root?, why to root, why to root your android? Thanks alot tarja. I hope this post has helped you. I tried my best to explain all about rooting here and I am glad you liked it.